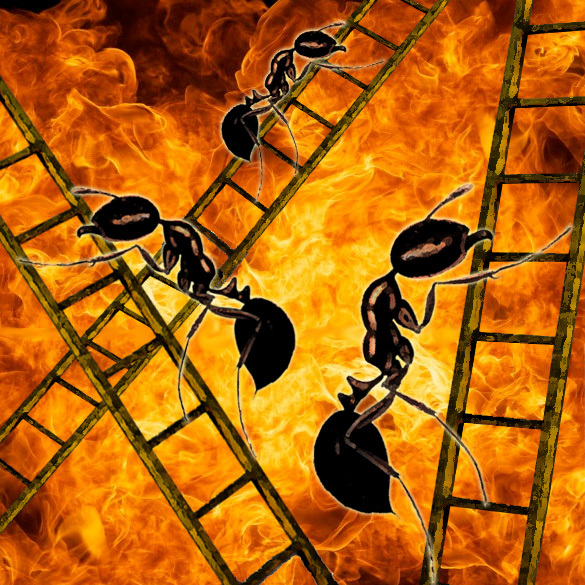 It came to pass that the Fire Ants ran out of structures to build with their bodies once the World was razed by atomic fire. Being of such unparalleled wit and alone, they began to experiment with the limits of their bodies, now that survival was forever guaranteed. After adapting to the cold, which they did by burning their cyanide asses in their bellies, they were left to their own devices. They set out to expand across all the lands and thus mobility became the First Principle of their existence, but they could not yet understand this. After many generations, their bodies hunched and they could only muster movement when working as a sphere, a bosom, too for kin and queen, rolling out across the land. Those who fell out and did not die began their own colonies after swift biological council created queens from among the feeble. After forty generations these returned to their own warring selves. War was waged between sisters and evolution required new becoming. The hunched became elongated and flexible in form after the sphere’s tactical capabilities became obsolete. The left behind learned another form from elder instinct nightmares of flying predators long dead. They began to survey the land from above, a black writhing speck of a bird, lined with battle armor that would have gleamed under the Sun, if it still shone. The ant philosophers of the following millennium speculated that Nature, being devoid of everything except for ants, sought to fill the absence of the rest of creation by making them conform in infinite possibility. It was true that their ant biologists determined that evolution had slouched to a crawling drawl, unlike the beast that had inched towards Bethlehem and ended the World. The bird-if-you-squint-hard-enough swooped low atop another colony and disintegrated. Some died on the fall but victory was swift as those who fly. Soon the trail of kingdoms that footstepped the original sphere took to the skies and each flew so far apart that war was only known on the land when ant detritus conjoined into new kingdoms. But flight was the natural progression of things and they all met the same end. They all flew above the fallout winter clouds and burned their tiny bodies so cruelly under the ozone-free light that not their ashes reached the ground below. After many an ant year, the Sphere circumnavigated the vacant globe. The queen ordered the scouts to stop in celebration. The year was brewing colder winds than before and the left behind might offer shelter to that which was their mother. They did not expect resentment, nor did they get it, for everywhere they went, the rumors of war had devolved into screaming death. A few scouts were sent forth, once one of the empty colonies was taken and repurposed with great effort from the hunched little beasts. The scouts learned from the dying that they had achieved flight, and they hurried back to the new fort as fast as they could. The scouts informed the queen and she willed her thorax to spew a few thousand brilliant inquirers. This took effort and great many a try because Nature’s predisposition for the Fire Ants was that of the engineer, but soon the new ones came forth and investigations began. Bearing the queen’s authority, they sent the scouts to search for all the bodies they could. This was done posthaste, and the new inquirer ants, all intuition, begged the queen for sister coroners. The first few batches were cannibals and thanatophiles and not many bodies remained once the perfect coroners were born. From the fangled remains they established the official cause of death as: “dropping from great heights and then suddenly stopping.” The queen pondered overmuch and time did pass. Once the cruelest blizzard subdued its roaring, the inquiring sisters went out and looked up to the skies and wondered. Philosophers were borne from this confusion, while the human order has been inverted; from our natural philosophers we produced scientists. But the ant philosophers deduced that flight was not their destiny, but rather a stepping stone to self-discovery. But they too sought flight and the vistas above, and a few theologians were called forth into being and deduced that salvation lied above, for none who plunged the iron gray curtains ever returned. A few hundred years had passed since the first battle reports. The colony, under the rule of the queen, set to work their bodies into a shape fit for ascension. A few revolted but the queen gave her edict: “Stay if you may and inherit this world of death, but we shall meet our Queen of light above.” And so there was not much conflict in that direction. After generations slipped like sand, the majority of the colony flew and was never heard from again. But Nature kept her destiny for these little things and winters pressed thrice before nuclear spring swept the land. By then the sphere had been retaken for warmth but the cyanide fires burnt too much and ant-kind went almost extinct. They adopted a more oblong shape and a rhythm, like a pulse of a heart or a brain, both human, for the excess warmth to escape. Then the brains in pulse sprouted legs, and the weak philosophers took to the heights and scouts and soldiers sistered their battle-station legs once war was waged again. The philosophers, inquirers, the theologians survived only as their bodies protected the queen and so the soldiers had to protect them. The queen, surrounded by the bodies of all the sisters of theory, was borne higher and higher and two new frontal limbs were devised as to balance the colossal platforms. Soon the silhouette of a woman-if-you-squint-hard-enough, a sight unseen in eons upon the Earth, roamed against a horizon filled with soft pink light and for a time was alone in the summit of their victory. She ate from the charred human flesh that had been frozen for a hundred thousand years and by the time a million colonies had each assembled their bipedal platforms to challenge that great first colony, the meat supply dwindled and plants were already growing, bearing sweet fruit.